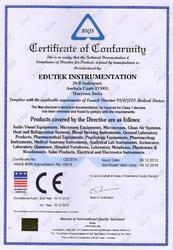 Edutek Instrumentation has successfully carved a niche in the global lab instrumentation market since its establishment in the year 1973. Standing on the edifice of quality and manufacturing expertise, we have become a renowned name engaged in manufacturing and exporting quality tested and reliable lab glassware, lab apparatus and scientific instruments. Our assortment of lab apparatus includes Hospital Equipment, Laboratory Balances, Laboratory Glassware, Physics Lab Apparatus, Laboratory Chemicals, Physics Lab Equipment and Laboratory Research Equipment. Further, we also supply Science Lab Apparatus, Biology Equipment, Pharmacy Lab Equipment, Electronic Equipment, Laboratory Wares and Microscopes to the global market. These precisely engineered products are fabricated using resilient & light weight material and sophisticated machinery as per international quality standards. Also, we have been accredited with ISO 9001: 2008 certification and are listed as an international FDA (CDRH) site establishment. Our organization has positioned itself strategically and promises to grow further under the able guidance of our mentor Mr. Aaditya Kumar. His knowledge and understanding of the market dynamics has helped the organization gain its present stature in the global market and muster a loyal clientele. We are looking for foreign buyers for Lab Glassware & Scientific Instruments. Manufacturing and Trading of engineered laboratory glassware, chemistry laboratory equipment and scientific instruments. Untiring efforts of our team have helped the organization to gain a distinguished position in the market. These professionals hold immense experience of working in the concerned sector and are well versed with modern technology. Recruited in the basis of their skills and proficiency, these professionals are streamlined among different departments as per the requirement. The individuals have been assigned with the responsibility of maintaining a systematic functional approach in every department so as to optimize production and curb wastage of resources. Right from the stage of manufacturing till management and final delivery of consignments, the professionals supervise the entire process to ensure timely delivery of the consignment as per client’s requirements. We specialize in offering user friendly, reliable and industry specific lab glassware and scientific instruments. Backed by an experienced workforce and vast infrastructure, we successfully develop standard as well as custom-designed instruments as per international quality standards. Our forte lies in offering extensive range of quality approved lab equipment and glassware at industry leading prices. We maintain a ready stock of the entire product range and promptly deliver the consignments using modern shipping and transportation channels across India and abroad.